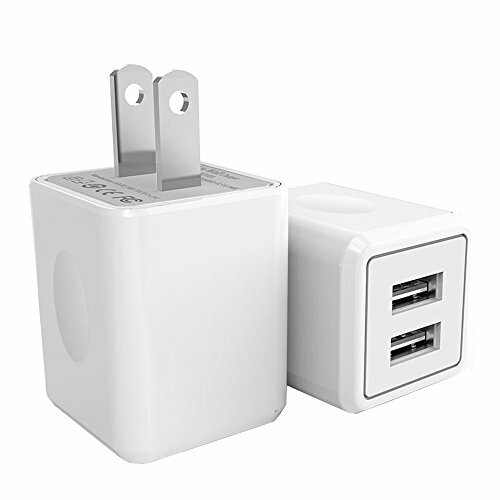 High Quality and Secure USB Wall Charger is compatible with most USB devices. Dual USB port output, total current 2.1A, can use both devices to charge at the same time, bring more convenience to your life and save your precious time. Smart IC Technology:this wall charger can automatic recognize any USB Support devices, maximize the charging efficiency up to max 2.1Amp/5V. Dual usb port enables you to charge two devices simultaneous. Save Your Time! Safety System:Excellent design assurance safe to charge, the wall charger has protection system against over charge, over currents, and overheat protection. So you can rest assured when you charge your devices. Package & Warranty:Included 2 Pieces Wall Charger block. One year Limited Guarantee from the purchase date. You can enjoy replacement or refund within one year. Please let us know if you have any question, we offer friendly and prompt customer service. If you have any questions about this product by UltraSealers, contact us by completing and submitting the form below. If you are looking for a specif part number, please include it with your message.